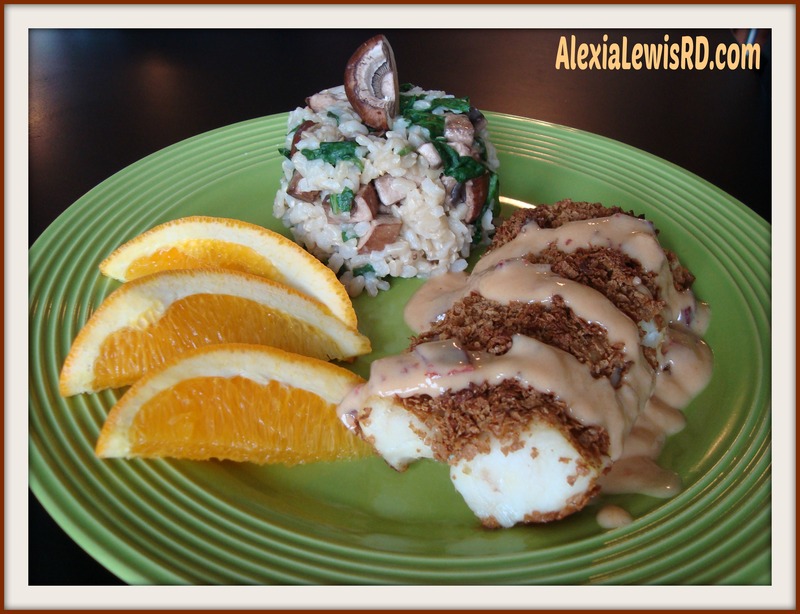 “D”-vine Orange Chipotle Cod: A Dish High in Vitamin D | Alexia Lewis R.D. Vitamin D is one of those vitamins that keeps popping up in the media as beneficial for our health and it’s a vitamin that many of us are lacking. I created a recipe high in vitamin D using Atlantic cod, orange juice, bran cereal flakes, and chipotle. 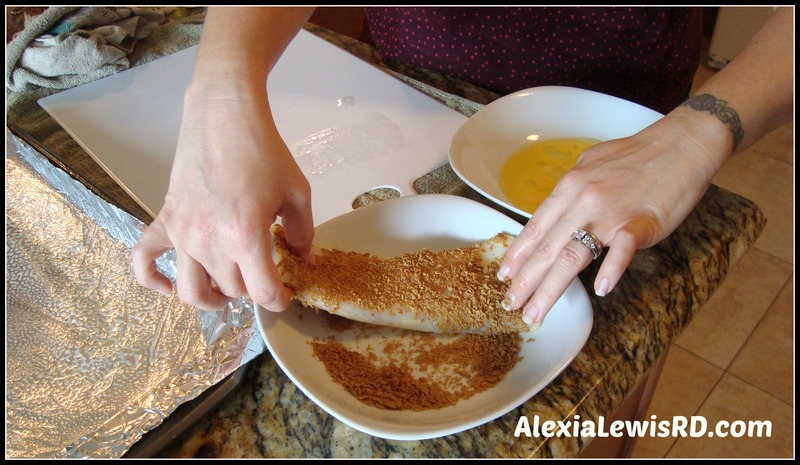 The result was a divine vitamin-D rich Orange Chipotle Cod recipe. 904 Fitness Magazine gave me this challenge to go along with a vitamin D article that is in the May edition. As a dietitian, I love turning to food before supplements so I accepted the challenge! According to the CDC, 31% of non-Hispanic blacks, 12% of Mexican Americans, and 3% of non-Hispanic whites have vitamin D deficiency. Vitamin D is called the “sunshine vitamin” because substances in our skin are activated by the UV rays to produce vitamin D. This partially explains why vitamin D deficiency is higher in those with darker skin (which protects against UV rays) as well as those who live in climates with less sunshine or who spend more time indoors. The recommended amount of Vitamin D for adults between 19-70 is 600 IU (international units) per day. A deficiency may cause bone issues such as bone pain, muscle pain or spasms, osteomalacia (soft bones), and rickets in children. Since many people supplement, I’ll also give you the tolerable upper limit, which is 4,000 IU per day. Research is ongoing that is looking at the effects of large amounts of Vitamin D so these recommendations may change in the future. A toxicity may cause bone loss and kidney stones – you cannot overload on vitamin D from sunlight. Vitamin D is important for calcium absorption and bone health. It’s being researched for its impact on heart disease, cancer, immune function, type 2 diabetes, blood pressure, and many other things. I’m a light-skinned white dietitian who lives at the beach in Florida and even I had low enough levels of vitamin D that my physician put me on supplements! So, it is difficult to get your D when you rely on sunshine and foods. Here’s why it is difficult to get enough vitamin D (600 IU) from foods… unless you are willing to swallow cod liver oil or can afford to eat salmon every day! Note that the fortified foods give an average for the IU of vitamin D and the actual amount can vary quite widely based on the level of fortification. When I was looking for cereals for my recipe, I found cereals with 0% to 25% of the daily value of vitamin D! It’s important to look at the labels for the fortified foods you choose. Also, notice that mushrooms contain much more vitamin D if they have been exposed to UV light. Since the packaged mushrooms in my store didn’t mention UV light on their labels, I asked my grocer about the mushrooms in the store and he had no idea if they were UV-exposed. I turned to fish and fortified foods to make a “D”-vine Orange Chipotle Cod dish that has 32% of the daily value (~ 200 IU) of vitamin D and packs a nice little spicy kick. This recipe is also heart-healthy with low calories, low saturated fat, no trans fat, and low sodium. It is a little higher in cholesterol than I’d like; but still within heart healthy recommendations. When preparing chipotle peppers, or any hot pepper for that matter, remember that the heat is mostly in the seeds. 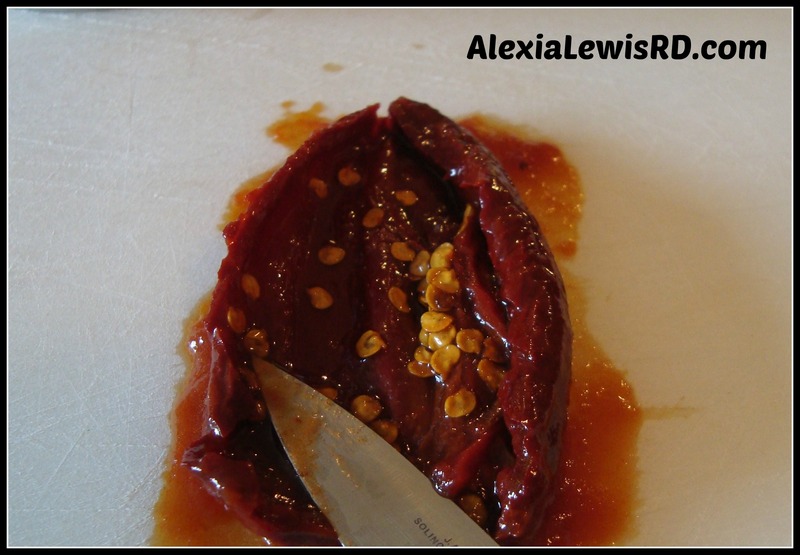 Chipotles pack a spicy punch so remove these little seeds before chopping to reduce the kick in the sauce. 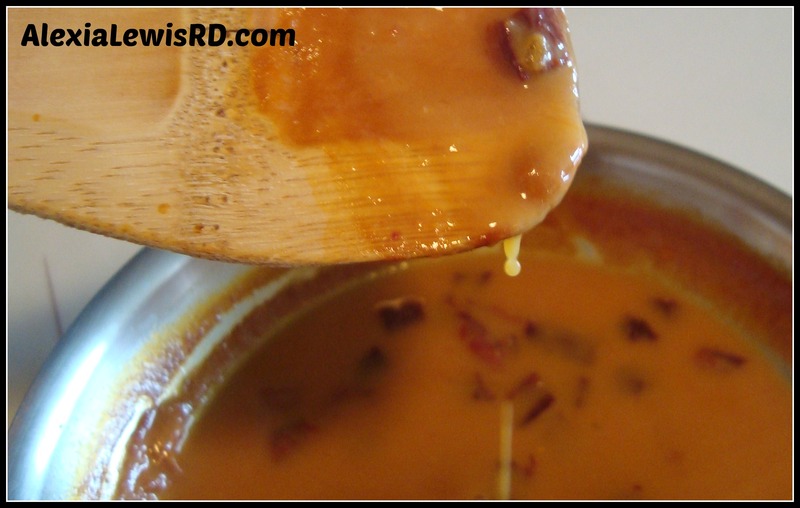 The thicker drops show that the sauce has begun to thicken – it will continue to thicken after removed from the heat. In a shallow bowl, crack eggs and stir to combine yolk and white. 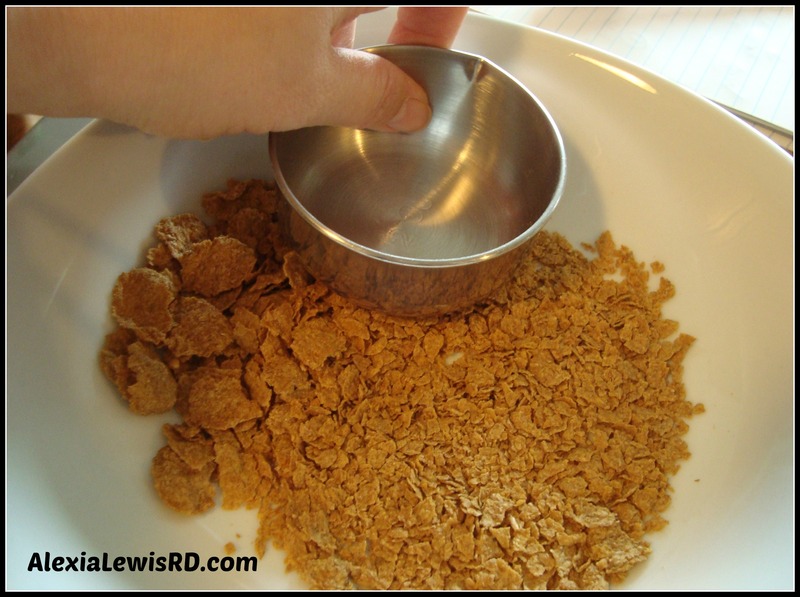 Pour bran cereal into another shallow bowl and use measuring cup or the back of a spoon to crush the cereal into small pieces. The smaller the flakes, the better the coating! To serve, top each fish filet with approximately 1/4 cup of sauce. Served with brown rice mixed with chopped mushrooms and spinach – enjoy! References as linked above, Nutrition: Concepts and Controversies, and the Linus Pauling Institute. You have given us a lot of good information on vitamin D. Thank you! Yep, I’d rather go with the portabello mushrooms!